People have been asking, “What’s happened?” It turns out that it’s been nine weeks since we posted anything new on the website and even longer since we said what-ho on our facebook page. Have we given up cruising? Have we swallowed the anchor and bought a small-holding in Portugal? The answer is, no; not yet. The answer is that a lot has been happening – so much that we haven’t had time to write about it. For a start, I’ve organised all the information that we gathered up during our year long journey from Puerto Williams to Valdivia, and I’ve written a book. But the book won’t be around for a while yet, so, in the meantime, we will continue to post articles giving a little glimpse of that wonderland known as the Chilean Channels. The second big item of news is that Caesar has got himself a job on a French charter yacht. He’s spending this southern summer making trips to Antarctica, the jammy so-and-so! If he likes it down there we will take Molly south again, someday, and have a look at the White Continent – but not until we’ve spent a bit of time in the Tropics, warming up. 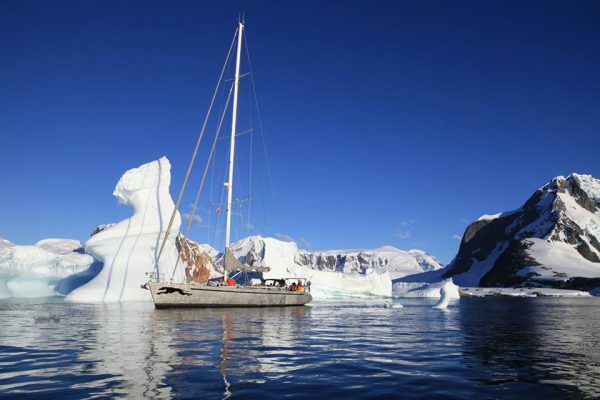 I’ve just heard that there’s one place still available aboard Tarka for her first Antarctic trip – but she’s leaving tomorrow… If anybody wants to leap on a plane at a moment’s notice and get down there, you can drop a line to Olivier. Our next item of news concerns Roxanne. She has also jumped ship! Roxanne has spent her entire life afloat and has now decided to see what bricks and mortar are like. She will be spending some months in England, studying for a university entrance exam in Science. After that, who knows what she might get up to? We’ll all have to wait and see. That just leaves Xoë, who is the piggy-in-the-middle of the three kids. 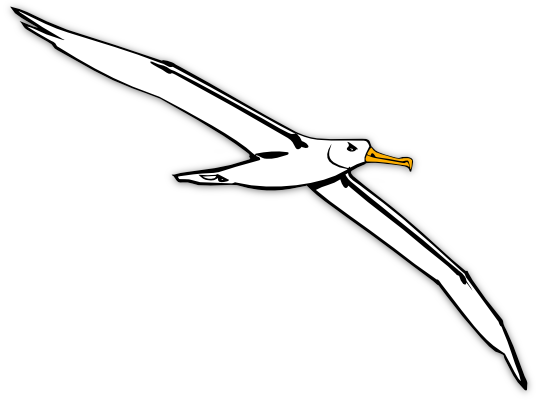 Xoë mutinied at the age of 17 and spent six months aboard another boat. She then went to England and has spent the past five years studying at universities in London and Sussex. During this time she also had to pay her own bills – because whereas, when I was a young’un, we got free accommodation and a generous grant, the Tory government ditched that system in favour of enriching the already super-rich. Tax-avoidance ‘loop-holes’ and tax-cuts for the Corporations having forced the abolition of the grant system (and having also brought about the piecemeal destruction of the NHS, together with the rest of the Austerity programme), Xoë had to get a job and work hard whilst working hard; but despite this she got the best grades for her class in every year, and she emerged with an Honours Degree and a Masters. Having earned her bits of paper and proved herself, Xoë has very sensibly decided to turn her back on The System – and she has now returned to the fold! Just before she embarked on her last year of studies, Xoë met our Brazilian friend, Gean. 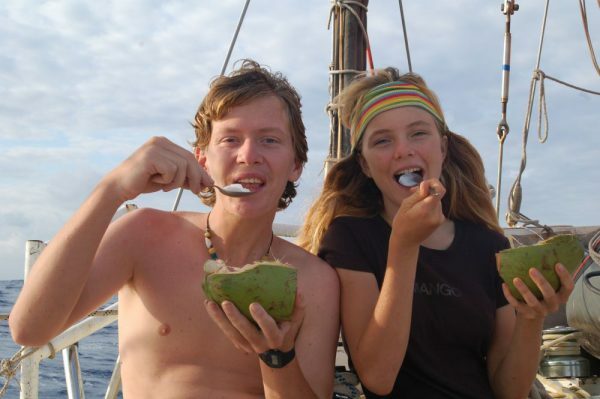 After five years of shore life, Xoë was just deciding that she wanted to do some more ocean travelling – like Gean. And Xoë was just about to ‘dread’ her hair – like Gean’s. And Xoë likes to play guitar – like Gean. And she enjoys hiking and abseiling – like Gean. So, the two of them made a trip to Scotland and climbed Ben Nevis; and they went abseiling with our good friend Pina, the dolphin lady; and they bought a couple of guitars… And then Gean’s visa ran out. If the old saying is true, and “absence extinguishes small passions and fires greater ones”, then this relationship has been tested and found to be great. After six months, Gean flew back to England, where Xoë had been waiting patiently (whilst studying hard and slaving to pay the bills); and after a further six months together they’ve now decided to live happily ever after. True to form, Xoë made this decision and then booked the registry office for the following week… a fact which has shocked certain members of the family. Xoë and Gean have been together for somewhat longer than Nick and I had known each other before we tied the knot – so we certainly can’t complain. And, after all, what is there to complain about, anyway? We’re acquiring a son-in-law who loves our lifestyle and who is also a thoroughly nice, warm-hearted person. Moreover, he has shown himself to be adept at mending engines and cleaning up rusty steelwork! He learned his ‘long-splices’ aboard this very ship but has also now sailed many miles with others. This young man even knows how to build walls and mend roofs, and since he grew up on a farm he can probably make things grow – all of which might come in handy if we ever do buy that bit of land, somewhere! Oh, and he also bakes bread and cooks delicious meals. All in all, it seems to me that Xoë has hit the jack-pot. What a find! 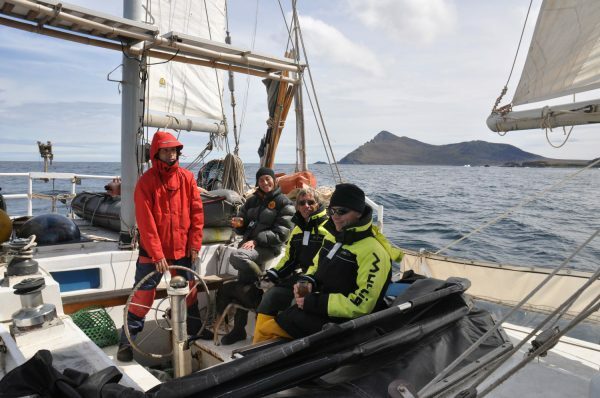 Xoë and Gean are currently with us aboard Mollymawk – but Molly is not going to be carrying any of us anywhere in the next few weeks. 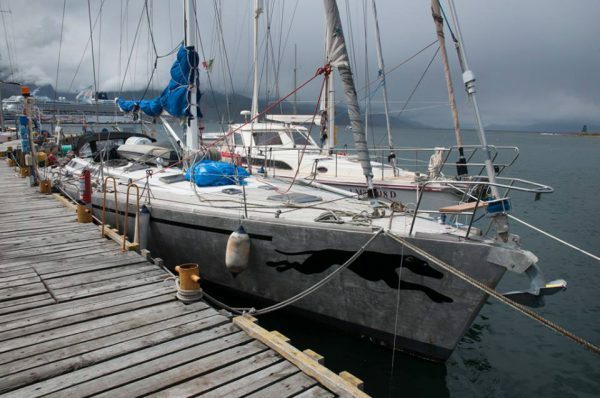 As I write, she’s sitting on a slip in Valdivia, receiving some much needed love and care. It’s been nine years since we last had the boat out of the water. In the interim she’s been leant on a quay on a couple of occasions, and we’ve dived on her – so we have been keeping an eye on things – but there’s plenty of work to do, “down there”. 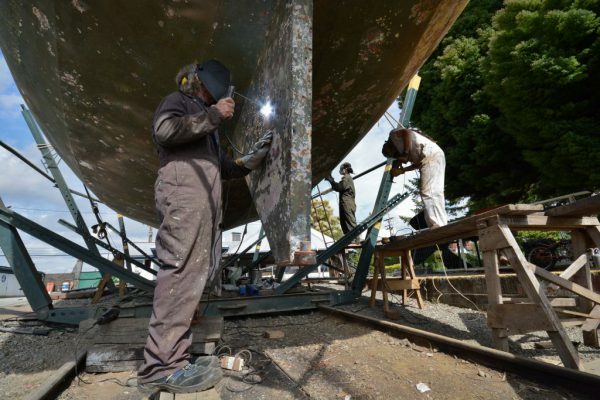 We’ll tell you all about it in due course, and we will provide an update on the copper antifouling saga. 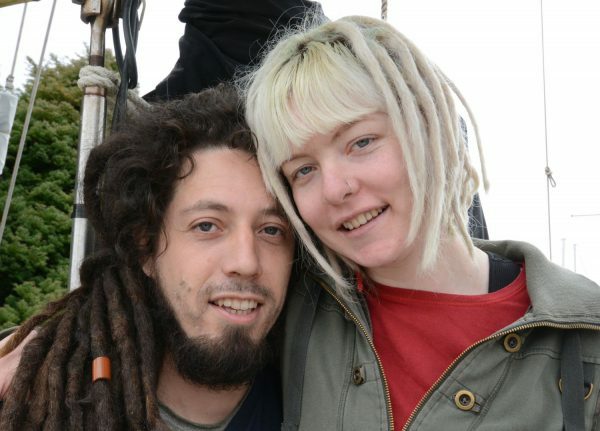 Rather than spend their honeymoon gadding about in South America, Gean and Xoë are staying aboard Mollymawk. They’ve taken up residence in the forepeak, where they’re jammed under the guitar and the snowshoes (and the cat) and squeezed alongside boxes of dried food and bags of sails which have had to be shifted during our repair work. And they’re not just hanging out; they’re also helping with the work. After they’ve helped us to get Mollymawk back into tip-top condition, ready for another ten years of abuse, Mr and Mrs Monteiro plan to backpack South America; and then they hope to find work, perhaps in Antigua (Xoë is an Antiguan citizen); and then they will buy a boat of their own. That’s the Big Plan. If anybody feels like giving a wedding present to the happy couple, they would be very glad to receive donations towards the cause. Likewise, if anybody knows of a bargain-buy cruising boat… Something needing lots of TLC would be ideal. 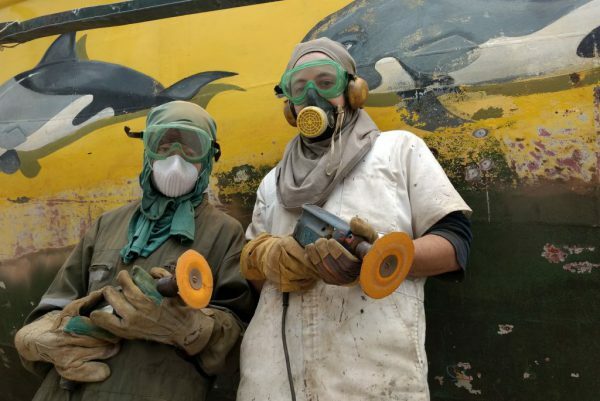 Besides working on the boat, during our long absence from the realm of the world-wide-web we Mollymawks have also made a brief foray inland, and before we post any more articles about glaciers and whales and the wettest village in the world we will share that adventure with you: Our next article will be about the driest desert. In the meantime we wish everyone a safe and happy new year. Let’s hope that over the course of the next twelve months the people might get their act together and do something to constrain the few who are taking the rest of us for a ride. And let’s do something more than just hope that this is the year when mankind abandons its addiction to meat and dairy and thereby saves the rainforests and puts the brakes on global warming: Let’s make that happen in our own lives! Congratulations Xoë!!! Best wishes from Canada / Sweden. Always a good read Jill and I have no problem with you slagging off politicians but get your facts right. It was T Blair’s Labour Govt that introduced tuition fees in 1998. Apologies for the delay in posting this. It’s true that Labour, under Blair, introduced the fees (as promised in their manifesto), but it was the Tories who jacked them up to their present level. Are Xoe and Gean still looking for a Boat? 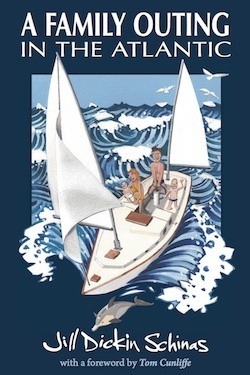 Well, they would certainly like to have a boat of their own – but they don’t have any money….